There’s no love lost between Harry Dresden, the only wizard in the Chicago phone book, and the White Council of Wizards, who find him brash and undisciplined. But war with the vampires has thinned their ranks, so the Council has drafted Harry as a Warden and assigned him to look into rumors of black magic in the Windy City. As Harry adjusts to his new role, another problem arrives in the form of the tattooed and pierced daughter of an old friend, all grown-up and already in trouble. Her boyfriend is the only suspect in what looks like a supernatural assault straight out of a horror film. 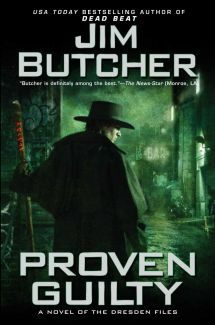 This action-packed and information-packed 8th volume of Jim Butcher’s Dresden Files series starts off with Harry witnessing the trial and execution of a 16 year old warlock who had used magic to seriously mess with the minds of multiple people. Harry is angered and disgusted by the execution but as the Merlin calmly explains, the warlock had caused the deaths of many people and his use of Black Magic had driven him insane. While Harry understands, he laments that there was nobody to teach the boy to prevent his misuse of his talent and therefore save him from his fate. Afterward, Ebenezar asks him to find out why the Sidhe, both Winter and Summer, have failed to respond to the invasion of Faerie by the Red Court the previous year. Ebenezar also invites Harry to lunch, though Harry declines. He’s still feeling somewhat betrayed by his one-time mentor since he learned that Ebenezar McCoy is the White Council’s Black Staff, ie. assassin. He’s not quite ready to forgive Ebenezar for the deception. As Harry leaves the gathering of the Council, he is again tempted by Lasciel to take up her coin, an offer to which he responds angrily. The thing is that she has helped him out considerably in the past and the more he seeks her assistance, the more likely he is to continue doing so. She is very anxious to stay alive and if Harry were to die, so would Lasciel. As if his various assignments from the Senior Council and the temptations by Lasciel weren’t enough, Harry is run off the road while driving the Beetle by an unidentified person. What a great day he’s having! Upon being returned to his humble basement abode by Murphy, Harry makes ready to test Little Chicago, an exact scale model of the city set up in his lab. The model was painstakingly assembled and Harry hopes to use it in his work, hopes that it will make that work easier and more accurate. But he has to be very careful… if he and Bob have made any mistakes in the construction of the model, it could literally explode, killing Harry the very first time he uses it. So he prepares for the first use of the model very carefully, despite the mild concussion he sustained in the accident. When his preparation ritual is interrupted by the phone, he rants and raves a bit and then abandons the ritual to bail Molly Carpenter–eldest child of Michael Carpenter, Harry’s friend and Knight of the Cross–out of jail. When he arrives downtown, he discovers that Molly isn’t the one in jail. It’s her boyfriend, Nelson, and he’s innocent of the charge of assault for which he’d been arrested. Molly pleads with Harry to help him and so Harry does, but in doing so he unknowingly gets swept up in a case that will not only lead him to the warlock practicing black magic that he’s been charged by the Gatekeeper to find, but into Faeire itself… straight into the heart of Winter and its struggle with Summer. The usual players are present once again and Harry has some pretty deep discussions with several of them, including Molly, her mother Charity, Father Forthill and Murphy. He also tries to have a discussion with his brother Thomas but the White Court vampire has been acting very odd as of late, and is hardly ever around anymore. Harry suspects that he’s actively feeding again and worries for him. Harry also meets with Fix, the Summer Knight who brings along the Summer Lady, Lily, the youngest of the Faerie queens of Summer. They’re compelled to not reveal much of anything at all to him but he gleans that Summer hasn’t reacted to the invasion of Faerie by the Red Court because if they do, then Winter will strike at them while they’re otherwise occupied. Since Lily isn’t able to tell Harry what he needs to know, he asks her to call in Maeve, the Winter Lady, who is under no compulsion to prevent her from talking to Harry. She hints that Mab, the Winter Queen, may just be insane. As if Harry doesn’t have enough problems to be going on with! I might have dwelled upon that particular conversation a bit too long, but it’s important in regards to the rest of the series, I think. Harry and Murphy banter back and forth quite a lot and Butcher even includes a short story on this very subject in his collection, Side Jobs, published last year. If you haven’t picked it up yet, I enthusiastically encourage you to do so. Aside from the short in Side Jobs, Butcher has Harry getting ready for an actual date with Murphy upon their return from Mexico at the end of book 12, Changes. Of course, the date between the long-time friends and colleagues never happens as readers of the series to date well know. The reason that it never happens is something that makes the final short story in Side Jobs, which is from Karrin’s point of view, all the more sob-inducing. As Harry works the case–which involves phobophages in the form of horror movie monsters crossing over from the Nevernever to feed on the fear of the people attending a horror movie convention called SPLATTERCON!!! before killing them–he realizes that someone is following him, though he’s unsure as to whether it’s the same someone who had previously run him off the road. He also encounters a movie producer named Darby Crane, who sets off his spooky alarm bells and quickly becomes the person that Harry likes for the culprit responsible for summoning the phobophages. After yet another attack, which Harry mostly fended off by casting a spell to send the phobophages after their summoner, he and Rawlins are heading out to track them and therefore find the summoner when a van hits Mouse and Harry and Rawlins are kidnapped by Darby Crane and his lawyer. They’re not held for long, however, and despite having apparently been sold by Crane on eBay, Harry and Rawlins make their escape, ironically from the very garage that Harry was held in back in book 2, Fool Moon by the lycanthropes that had kidnapped him. Upon escaping, they’re joined by Thomas and a very much alive, if battered, Mouse, who actually led Thomas to Harry and Harry realizes that Crane–aka Madrigal Raith and Thomas’ cousin–is just the fall guy, and not actually responsible for the black magic. As they’re making ready to leave, another phobophage shows up and surprises Harry with it’s strength and immunity to his magic. Difficult as it proves to get away from the creature, they do and Harry tracks the phobophages that he’d sent after their summoner. His spell leads him to the Carpenter house where he learns that Molly has been taken. But not by phages, by Fetches of the Winter Court. Harry uses Little Chicago to find where they took Molly over into the Nevernever and mounts a rescue attempt, accompanied by Thomas, Murphy and Molly’s mother, Charity, since Michael is out of town on ‘business’. They are assisted–Charity is assisted, rather–by the Summer Lady and Knight and are successful. Harry also encounters the Winter Knight who has been tortured and imprisoned for years and his Godmother, Lea, who is also being punished and imprisoned by Mab. Unfortunately, she’s a little insane though she does tell him that by using the power of Summer at Winter’s heart in order to rescue Molly, Harry has alerted the Winter Fae who are all now heading to kill him. They make a run for it and escape, and Harry learns that Lily kind of used him to distract the forces of Winter in order to free up Summer to assist the White Council. Once Charity is back at Saint Mary of the Angels with her family, Harry discusses with Molly her options. He tells her that she broke one of the laws of magic when she interfered with a couple of her friends to keep them from using drugs and that she has to answer to the White Council. Despite a hefty dose of denial, Molly eventually comes around and decides to turn herself in, once Harry assures her that the Wardens will have to go through him to execute her for the crime. When they show up for the hearing, Lily and Fix arrive and officially commend Morgan for his valor at the recent battle against the Red Court. Lily also credits Harry with the success of the campaign, relaying his incursion into Faerie and his assault on Arctis Tor, the heart of the Winter Fae, which distracted the forces of Winter and allowed Summer to assist the Council against the Reds. Harry knows this is all nonsense but it sure makes him look good. Harry then stands for Molly in her hearing at which all but two of the Senior Council are absent. Only Rashid and the Merlin are present and the Merlin finds Molly guilty and orders her executed. Harry begs Morgan not to do it and Morgan appears to have reservations. Before he can carry out the Merlin’s sentence, however, a slew of Warden trainees show up with Captain Luccio, several members of the Senior Council and none other than Molly’s father, Michael… the Knight of the Cross. Turns out, he’d pretty much saved their asses from demons and the Council was somewhat inclined to vote in Molly’s favor because of this. While she’s under the Doom of Damocles, she’ll live and become Harry’s apprentice. Harry finally confesses to Michael that he picked up Lasciel’s coin and is shocked to learn that Michael already knew… that he’d seen the whole thing. He’s happy to hear that Harry hasn’t taken up the coin and tells Harry that he’ll be there for him if he decides to give up the coin, and his power with it. He then tells Harry that if he changes, he’ll also be there. To wrap up the book, Bob tells Harry that there had been a flaw in Little Chicago but that it had been mysteriously fixed before Harry had used it to track Molly. I’m guessing that Lasciel had something to do with that. We also learn that Murphy has been demoted for being AWOL for 24 hours while helping Harry rescue Molly. Thomas is pissed that Harry believed Murphy’s rejection, he seems to have some information from a talk with Murphy and thinks that Harry should try harder. Finally, Ebenezar visits and discusses the White Council traitor with Harry. They surmise that there must be more than one person acting in concert to cripple the White Council and attribute many of the things that Harry’s countered over the years to this phantom organization dubbed the Black Council by Harry. They decide to keep their eyes open and not to disclose their suspicions to anyone on the Council, seeing how there are most likely traitors in their midst. Then… Harry invites Ebenezar to dinner and reconciliation ensues. All in all, this is one of the most involved books to date in this series. Butcher steps it up a notch or three with all of the Faerie court drama as well as the probable long-time existence of the Black Council. There are info dumps galore but they’re artfully done and the reader, especially when listening to the masterful reading of James Marsters as I have been doing during my re-listen of the series, must pay close attention or miss vital information. My apologies if I forgot any tidbits, there was quite a lot of ground to cover with this one. My further apologies for the length of this post… again with the amount of ground to cover thing. If you read this far, you have my thanks… why don’t you leave a comment to attest to your perseverance and dedication? Next on my list of re-reads to get up to speed on the series before the release of Ghost Story in July: book 9, White Night! The one in which Harry: witnesses the execution of a kid who’d been practicing black magic; gets a call for help from Michael Carpenter’s 17 year old daughter, Molly; goes to a horror convention; chats about matters of the heart with Murphy… a few times; is auctioned off on eBay; has a drink and a talk about Faith with Father Forthill; has a heart-to-heart about magic with Charity Carpenter (there are quite a lot of personal chats going on in this book! ); storms Arctis Tor, the heart of Winter to rescue Molly; saves Molly again, this time from execution by the White Council for breaking the 4th Law of Magic and takes her on as an apprentice; confesses to Michael that he picked up a Blackened Denarii only to learn that Michael had seen the incident; fends off Molly throwing herself at him, thinking that’s what he wants and/or needs after their soul gaze; discusses with Ebenezar the possibility of traitors on the Council and dubs them ‘Black Council’; and finally… over the course of his talk with Ebenezar about the traitor(s) on the White Council, he reconciles with his old friend and mentor. Since I’ve already finished White Night –I’ve been listening a LOT the past few days!– I just need to get its review finished and then 3 books to go before Ghost Story. I’m so anxious! Hey, baby, I have stamina and perseverance! 😉 I read through the end, too! Looking forward to your review of White Knight. Yeah, I’m just… sneaky like that.